Bel Air, CA is an affluent suburb of Los Angeles, situated between Beverly Hills to the east, Brentwood to the south and west, and Sherman Oaks to the north. 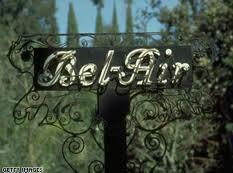 Bel Air was founded in 1922, after Alphonzo Bell developed over 600 acres of land which became Bel Air Estates. Bell’s vision was to create a luxury community for Hollywood elite and influx of wealthy residents attracted by the film industry. The great thing about living in Bel Air is that much of the community is residential. It is also very centrally located, within close driving distance of Beverly Hills, Century City, LAX and the beach communities of Pacific Palisades and Malibu. Homes in Bel Air generally range from about $1,000,000 on the low end, to upwards of $50 million or more on the high end. Below is a partial list of Bel Air homes for sale, which is updated daily. If you would like more information on any of these properties, please give me a call at (800)399-9659 x313 or you can leave your contact information on my contact form and I’ll get back to you within 24 hours.